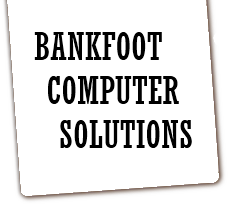 No Fix, No Fee - Bankfoot Computer Solutions operate under a no fix, no fee policy, so if we can't repair your computer problem onsite or at our premises there is no charge to you . No Callout Charges - We have no callout charges for the local vicinity and don't charge a diagnostic fee, so no costs are incurred until the problem is resolved to your satisfaction. Quote - We can provide you with a quote before any work is undertaken. Value For Money - Combined with our high quality, efficient service, our charges are a fraction of that of our high street competition. In fact with the poor service many of them provide and the prices they charge we often wonder how they sleep at night! 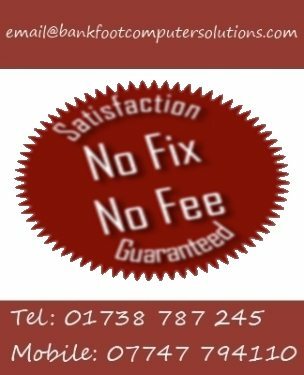 If you contact us to discuss your problem, we will happily give you free advice and can provide you with a no obligation quote which is guaranteed to be cheaper than our competitors. Parts - If any component parts are required to repair your computer or laptop, we can quote the cost price of these and your computer will be repaired as soon as the parts are available. Areas Covered - We cover most of the Perthshire area and slightly further afield including but not exclusive to Aberargie, Aberfeldy, Abernethy, Abernyte, Acharn, Airlie, Almondbank, Alyth, Amulree, Auchterarder, Balbeggie, Ballinluig, Bankfoot, Birnam, Blackford, Blairgowrie, Blair Atholl, Braco, Bridge Of Cally, Bridge Of Earn, Buchanty, Burrelton, Butterstone, Calvine, Caputh, Carse Of Gowrie, Comrie, Coupar Angus, Computer Repair Crieff, Dalguise, Dull, Dunblane, Dundee, Dunkeld, Dunning, Elcho, Errol, Fearnan, Forgandenny, Forteviot, Fortingall, Fowlis Wester, Gilmerton, Glen Devon, Glen Lyon, Glencarse, Gleneagles, Glenfarg, Glenshee, Gowrie, Grandtully, Greenloaning, Guildtown, Harrietfiled, Huntingtower, Inchture, Inchyra, Inver, Invergowrie, Kenmore, Killiecrankie, Kinfauns, Kingoodie, Kinloch Rannoch, Kinnaird, Kirkmichael, Kinross, Kinrossie, Lawers, Letham, Lochearnhead, Loch Rannoch, Lochty, Logierait, Luncarty Computer Repair, Madderty, Meigle, Meikleour, Methven, Moneydie, Moulin, Murthly, Muthill, New Fowlis, New Scone, Perth Laptop Repairs, Pitcairngreen, Pitlochry PC Repair, Rait, Rattray, Redgorton, Rhynd, Ruthvenfield, Scone, Spittalfield, St. Fillans, St. Madoes, St. Martins, Computer Repair Stanley, Strathearn, Strathtay, Trinafour, Tummel Bridge, Waterloo, Weem and West Kinfauns.